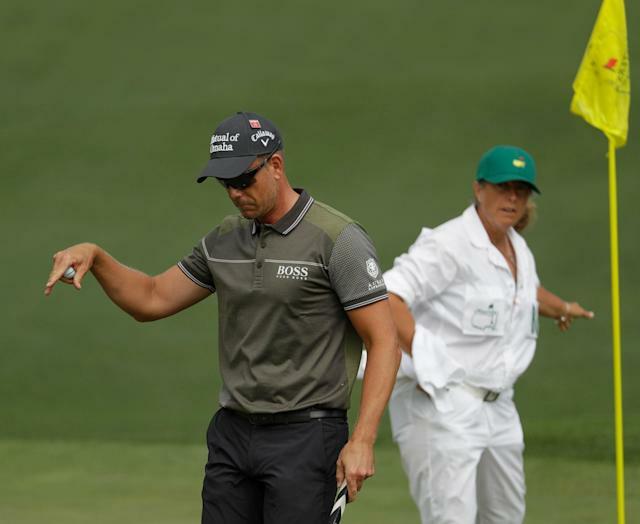 AUGUSTA, Ga. — Henrik Stenson was walking off the 9th green Thursday during the opening round of the Masters. He was in the middle of a grind — he’d finish 1-over — trying to find his game. Yet despite the pressure of the event and magnitude of the stage, he couldn’t help but spy Taylor Parrott, seated in his wheelchair, beaming with excitement. Taylor has an infectious grin and here he was conveying unbridled joy at something simple … just being here watching his favorite golfers on his favorite course during his favorite tournament. He’s 25 and suffers from cerebral palsy. While that can and has weakened his muscles and made verbal communication difficult, it can’t and won’t touch his spirit. If anything, it magnifies it. Stenson was headed to the 10th tee when he decided to stop for a second and interact with Taylor. How couldn’t he? That smile. That enthusiasm. Stenson runs a number of camps back in his native Sweden for handicapped golfers, especially kids. He knows that look. He knows it well. So he pulled out his golf ball and handed it to Taylor Parrott. "That’s a small gesture from me,” Stenson said later. And Taylor somehow smiled even bigger. “He seemed to enjoy it,” Stenson said. 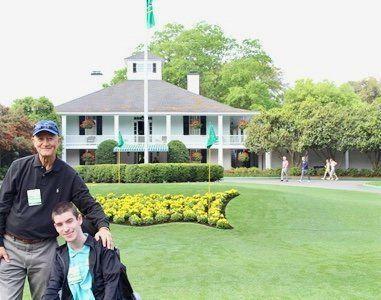 So, too, did the man behind Taylor, his 65-year-old father Chip, who had first come to Augusta National decades ago with his dad and now, despite the significant challenge of trying to push an old-school wheelchair up and down the club’s steep hills, was completing the circle by bringing his son. Taylor was smiling. Chip wasn’t. He was too busy crying at what he was witnessing. The Masters is a golf tournament — big money, big pressure. Yet all around historic Augusta National Golf Club, it is often the smallest of moments that can impact the most. The venue tends to inspire strong emotion — a step back in time, a reconnection to family, some kind of hallowed, holy ground worth aspiring to see. Chip Parrott knew that because growing up in South Carolina his parents had brought him here. His love and connection to the Masters and Augusta National never waned. Yet the idea of trying to bring his own son here just seemed impossible. Augusta National tries to be as handicap-friendly as possible, but this is a golf course, requiring fans to traverse grass and gravel and inclines and everything else. Taylor loves watching golf, though. His disease has stripped him of the power to even grip a club or walk a step, but playing the game isn’t the only way to connect with it. “He knows all the golfers,” Chip said, to which Taylor nodded proudly. He knows all sports, apparently. What about the Masters though? Impossible, it seemed. Chip is in his 60s, a retiree after working 35 years at the H.B. Robinson Nuclear Plant in Hartsville, South Carolina. His wife spent 35 years working at UPS. They care for their son and take him everywhere, but could everywhere include Augusta National? “We were concerned about the hills,” Chip said. Like all golf fans, Taylor wanted to go, of course. And it’s not that Chip is afraid to push his son and the wheelchair — he regularly hauls Taylor around while running 5K road races and has finished five marathons on his own. This would be something else though. Finally Chip decided there was no time like the present to try. Who knows how it would go? Some of his friends tried to gently talk him out of it. Father and son were undeterred. They set out early and just getting through the gravel parking lot was tough. Once on the Augusta National grounds, there were slopes and hills, but at least much of it was paved. Then came the course. “I told Taylor I could get him to Amen Corner,” Chip said of the famed three-hole stretch that is in the far reaches, and lowest elevation, of the grounds. “I just might not be able to get him back,” he said with a laugh. They tried to get down the 10th hole but made it only halfway before turning back. The pushing was a struggle, but some other fans stepped in and helped. It didn’t matter to Taylor; just being here was incredible. Instead they staked out a spot next to the driving range and got a close up view of Tiger Woods, Taylor’s favorite. Then they watched the ceremonial first tee shot from Jack Nicklaus and Gary Player, who also noticed Taylor smiling bright. It was that kind of day. Acts of kindness from strangers. Moments of graciousness from famous athletes. A sense of pride and power between father and son. Then Henrik Stenson topped it all off by handing over a memento that is destined for Taylor’s room. It was special, Chip kept saying. Just special. This entire thing. “It hit me that my dad brought me here as a child and now I’m bringing my son here as well,” Chip said. That’s Augusta National, far from the leaderboard, far from the birdies and bogeys and gut-wrenching pressure. This is one hell of a golf tournament. It’s also, in so many ways, so, so much more.